When storage space is at a premium, many retailers of will use front of house shelving that has the dual function of both practical storage and display. The E-Z-RECT Trimline shelving system lends itself to this use perfectly, thanks to slimline profile components and an attractive finish. Shoe retailers can often benefit the most from utilising storage racks on the shop floor due to the large number of products they offer, having more than one size on display also helps to convert visitors into customers - whilst also meaning less trips to the stockroom for the staff. The example below-left shows how a children's shoe retailer uses Trimline shelving in a number of ways to maximise the space available. A central double-sided island rack stores a vast number of shoe boxes with a sizeable display section on top. Even the awkward under-stairs section has its own shelving rack to make the most of every inch of space. Garment storage can also be tricky to get right, retailers traditionally call upon hanging rails to combine display and stock holding but there are alternatives. 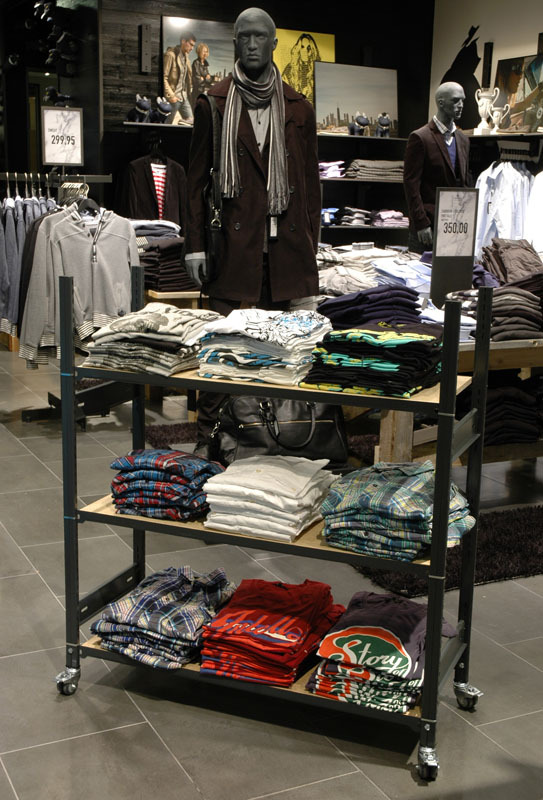 With the main image above image you can see how Trimline shelving has been used in a pigeon hole configuration to good effect for storing polo shirts and jumpers. Customers can select the style and size of clothing they want very easily and as an added bonus, the staff can easily see when an item is running low on stock and needs replenishing. 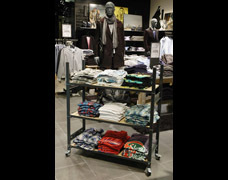 There are numerous ways to use this type of shelving in the retail environment, stores of all sizes can benefit from having E-Z-RECT shelving in the stockroom but smaller independent stores without the budget for high-end shopfitting units can easily create smart and functional storage/display units at affordable prices. 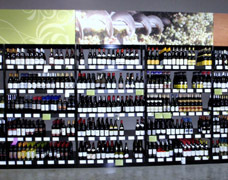 The example shown above-right uses EZR Trimline shelving to display and store large volumes of wine bottles and alcoholic beverages on the shop floor. Each shelf within this solution can hold up to 70 standard 750ml glass bottles - providing a good level of stock capacity. 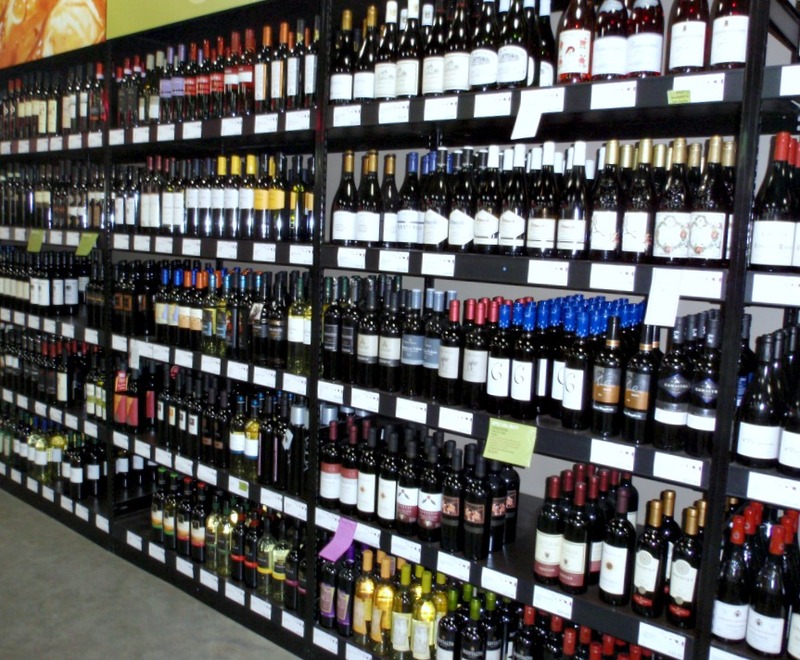 You can see how the slim profile posts and clear-entry shelves help to maximise every inch of space without restricting access to any single bottle. Call us today on 01993 779494 to find out how your shop can benefit from a similar solution.